Find Your Way out of the Parliamentary Brexit Maze in 9 Days! You are here: Home / Elections / EU Referendum #6 – Find your way out of the Brexit maze in 9 Days! Theresa May has just asked the EU Council for a 3 month extension to Article 50, the Speaker won’t allow another meaningful vote without meaningful changes, Jeremy Corbyn is pondering backing another referendum and in 9 days time, the UK could be leaving the EU without a deal. 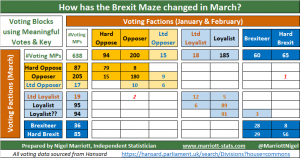 Just another week in the Parliamentary Brexit Maze but I have updated my Brexit Voting Factions after last week’s votes and identified an 8th faction for you to play with in your voting permutations. The voting record of all MPs in the House of Commons are recorded by Hansard and they have an extremely useful facility that allows you to download the voting data into a spreadsheet. I have used this to download the data for the two Meaningful Vote on 15th January and 12th March and all amendments related to these votes. I collated all this data, used Cluster Analysis to identify the factions and created a number of tables to summarise my results. All this can be downloaded by using this link – MPs votes on Brexit v4.1 – slim version. Previously I created 7 factions based on the 1st Meaningful Vote and 9 key amendments that took place in January and February. I have now created 8 factions using the 5 votes listed below. If you click on these, the link will take you to the Hansard data I used. In the above spreadsheet link, these columns are highlighted in purple in the DATA sheet. 1st Cooper Amendment ruling out No-Deal forever on 13th March. There was a second vote on that amendment later that evening after some political shenanigans which I couldn’t make head or tail of so I felt the 1st vote was probably the more meaningful one to use. Note Hansard appears to have a discrepancy in their data compared to what was reported in the news. Amendment calling for 2nd referendum on 14th March. Government motion calling for extension of Article 50 if the house says No to a 3rd Meaningful Vote. I chose these 3 amendments in addition to the 2 meaningful votes because they deal directly with some of the other options open to Parliament if the Withdrawal Agreement cannot be passed. As before, I started by looking at all combinations of the 5 votes (243 are possible!) and focusing on the most common combinations to identify factions. It turned out that 614 MPs could be matched exactly to the 8 voting combinations shown in the graphic here and the other 24 could be considered close matches to these 8 factions. The new 8th faction is the Loyalist?? line. These are MPs who have been loyal to Theresa May until now but in the vote to extend Article 50, they voted No or abstained. So they are a subset of the Loyalist faction but possibly tending towards the Brexiteer faction. To illustrate who is in what faction, I have used some MPs (usually a party leader) as representatives of each faction in this table. Finally I have compared my 8 factions today with the 7 factions I identified at the end of February. So how will the 8 factions combine to exit the Parliamentary Brexit Maze? What I am encouraged by is the fact that my 7 factions from Jan & Feb are still broadly correlated with my 8 factions today. Some Brexiteers have swapped between Hard and not-Hard, Loyalists are shuffling the deck between Limited & ?? and Opposers are swimming between Hard & Limited. This tells me that my 8 factions are subsets of 3 broad groups but it is still possible for factions to cross groups. As it stands, the 5 factions from Ltd Loyalists to Hard Brexit have a 20 vote majority over the 3 Opposer factions if they can combine. However, when No-Deal comes up, Ltd Loyalists switch sides to give an 18 vote defeat to Theresa May. I do think though that a 2nd referendum does not have the votes. The 17 Ltd Opposers have shown no enthuiasm for this at anytime and it is striking that the 12 Labour MPs in that faction all represent solid Labour Leave seats in the North & Midlands (My spreadsheet identifies the Leave seats using my own Leave vote share model). There are 123 sitting Labour MPs who represent Leave constituencies that are following Jeremy Corbyn’s lead so far and thus are in the Opposer faction, all but 7 representing seats in the North, Midlands and Wales. When they are finally put on the spot to say Aye or No to a second referendum, I am certain some are going to join the Ltd Opposers and vote that down as I can’t all of them going back to their constituents to explain why they voted for a 2nd referendum. The other question that is not yet answered is whether Jeremy Corbyn is a Remainer at heart. My opinion that he has not been put on the spot by Theresa May. So far he has led the largest faction to oppose No-Deal, oppose the Deal and support an extension to Article 50. None of these are inconsistent with current Labour policy and the 2017 Labour manifesto but if he was put on the spot to vote for Article 50 revocation, would he do so? If the answer is No and the EU will not allow an extension then he is in a Deal or No-Deal scenario. Perhaps he should be talking to Noel Edmonds!